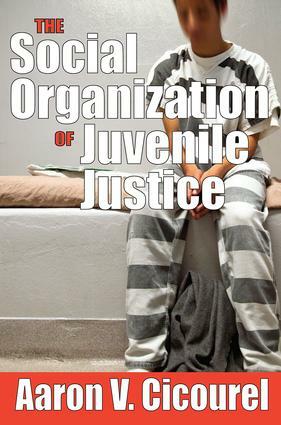 The Social Organization of Juvenile Justice recasts familiar sociological problems of research within a dramatically new and different theoretical and methodological perspective. In seeing law enforcement officers, no less than those accuse of criminal behavior, as locked into the creation of history, or more precisely, a series of retrospective and prospective interpretations of events both within and disengaged from, the social contexts relevant to what purportedly took place, Aaron Cicourel redefined the fault lines of contemporary criminology.The work makes imaginative use of a wide variety of new techniques of analysis from ethnomethodology to community studies—while at no point ignoring basic hard statistical data—in this study of juvenile justice in two California cities. Cicourel states the purpose of his book with clarity: The decision-making activities that produce the social problem called delinquency (and the socially organized procedures that provide for judicial outcomes) are important because they highlight fundamental processes of how social order is possible.This work challenges the conventional view that assumes delinquents are natural social types distributed in some ordered fashion, and produced by a set of abstract internal or external pressures from the social structure. Cicourel views the everyday organizational workings of the police, probation departments, courts, and schools, demonstrating how these agencies contribute to various kinds of transformations of the original events that led to law enforcement contact.This contextual creation of facts in turn leads to improvised, ad hoc interpretations of character structure, family life, and future prospects. In this way, the agencies may generate delinquency by their routine encounters with the young. His new introduction discusses with great detail the methodology behind his research and responses to earlier critiques of his work.